Queen Isabella & King Ferdinand - After almost 800 years of on and off conflict with Muslim kingdoms, the Spanish were poised to defeat once and for all the last Islamic territory in Western Europe by the end of the 15th century. The only way they could achieve this was through unification. And what better way to unify than by marriage? Isabella (1451-1504) was the daughter of King John II of Castille and León, and Ferdinand II (1452-1516) was the son of King John II of Aragon (John was obviously a popular name at the time). 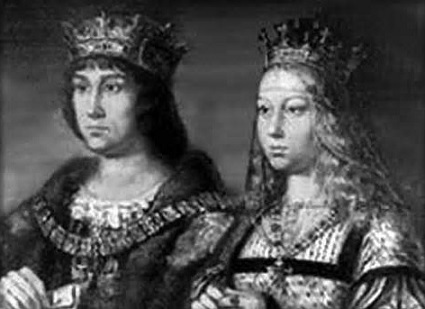 They were married in 1469, bringing together three of the most powerful Spanish kingdoms on the Iberian Peninsula (Ferdinand would become King of Navarre in 1512, after Isabella's death). At that time, Castille was the largest and most powerful of the four major Spanish kingdoms. In addition, Isabella proved to be a very strong willed individual. Her older brother, Henry, had tried several times to marry her off to different suitors, but she resisted each attempt. Instead, she secretly, of her own accord, arranged her own marriage to Ferdinand by negotiating with his father. So she herself brought a lot of power and influence to the marriage, and to the Spanish monarchy. When her brother died in 1474, Ferdinand and Isabella became king and queen of Castille and León; and when his father died in 1479, they added Aragon to their holdings. Their reign was dominated by a ten year conflict with the Emirate of Granada. When the war concluded in their favor (see Fall of Granada), they set about a policy of establishing national and cultural unity in their country; and did so by requiring that all their citizens be Catholic. Enforcement of this policy is what led to the infamous Spanish Inquisition. It began about three months after the Fall of Granada with the Alhambra Decree requiring Jews in Spain to either convert or leave. Tomás de Torquemada, a Dominican friar was appointed Inquisitor General to carry out the decree. Isabella, who was a staunch Catholic, was said to be behind the policy; however, she opposed depriving Jews of their wealth. Apparently though, Torquemada was in favor of it and obtained Ferdinand's permission to do so. It's believed that over the next decade, some 80,000 Jews were affected. About half were forced to leave, and the other half compelled to convert. Many Muslim and Jewish documents were destroyed at this time as well. The other major event of their reign, one of the most significant in history, was the voyage of Columbus across the Atlantic Ocean (see Christopher Columbus above). It would lead to the colonization of the New World and the formation of the Spanish Empire. Under King Ferdinand and Queen Isabella, the Reconquista was concluded, the unification of Spain was initiated (and completed under their grandson, Charles V) and the colonization of the New World begun. Combined, these events made Spain the most powerful nation on earth. It would remain so for about a century until its mighty navy was defeated by England at the Battle of the Spanish Armada in 1588.